Pop quiz: What kind of natural habitat is increasing in urban areas? This is not a trick question. Rather, the answer offers a slice of good news on a planet that has been increasingly turning from green to gray. Green roofs are on the rise in cities, according to Kelly Ksiazek-Mikenas, Ph.D., who has a newly minted doctorate degree from the Chicago Botanic Garden and Northwestern University’s graduate program in plant biology and conservation. In Illinois, where more than 99 percent of native prairie has been lost since the 1800s, this is especially good news. Dr. Ksiazek-Mikenas, a former biology teacher, spent six years studying these engineered habitats and their potential to support biodiversity. 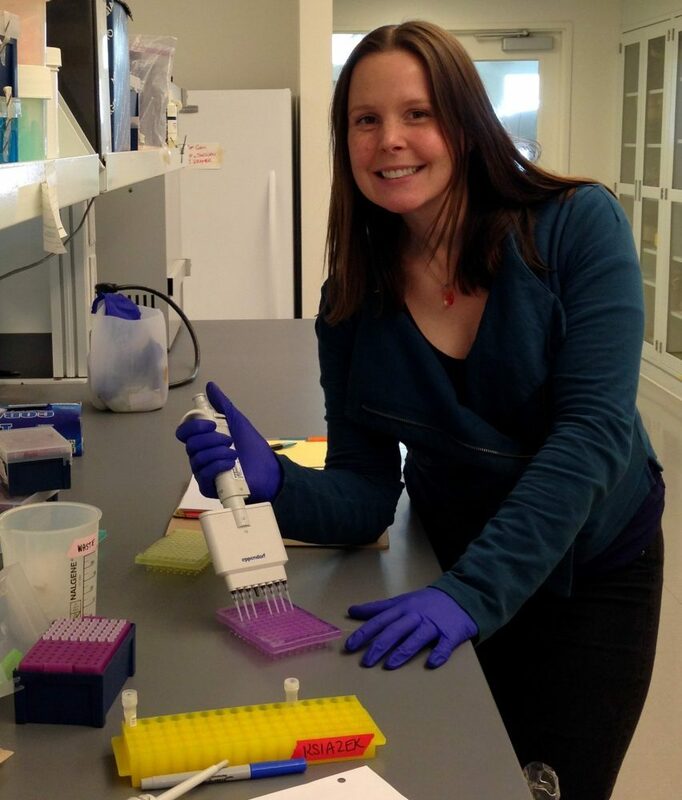 The plant scientist is now eager to share her findings: When started carefully and with a long-term plan in mind, these sites do grow up to support species, natural communities, and genetic diversity. “When you have these three pieces working, you have a good foundation that should sustain plant life over long periods of time and live through environmental changes, and that look and function like a diverse prairie,” she said. Dr. Ksiazek-Mikenas examined shallow (up to six inches of soil depth), low-moisture roofs from Glencoe, Illinois, to Neubrandenburg, Germany, before reaching that conclusion. While the roofs within the United States are generally younger, some in her German sites were up to 93 years old, providing a mix of data about green roofs at all ages. She also studied data sets and conducted shorter-term experiments to clarify the qualities green roofs need to succeed. 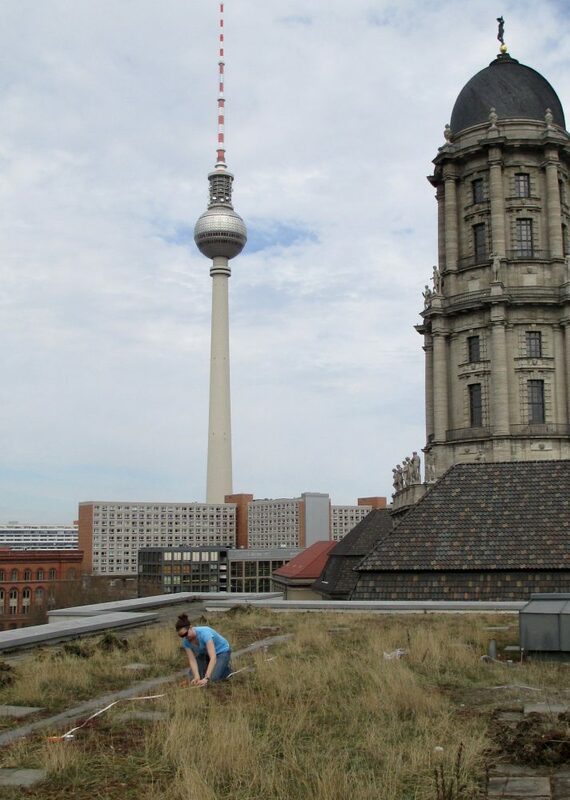 Dr. Ksiazek-Mikenas sets up insect traps in 2013 on a green roof in downtown Berlin. Her work had its ups and downs. She arrived in Germany looking for similarities, expecting the insect and plant species on one roof to mirror that on the others. Rather, she found differences between roof gardens. After a deep dive into data, she found the secret. Although the plant species differed between gardens, those that grew well shared the traits of being stress-tolerant and adept at establishing themselves in new areas. She was concerned by the lack of diversity on individual roof gardens both in Germany and in her study sites in Chicago. Back at the Chicago Botanic Garden, she set up an experiment to test how different soil types would affect which plants were successful, and whether she could create a more diverse community on one rooftop by planting both rock and sand prairies. She planted her experimental plots on the Josephine P. & John J. Louis Foundation Green Roof Garden North on the Daniel F. and Ada L. Rice Plant Conservation Science Center and monitored activity over three years. She found success in growing a more diverse habitat. In related work at the same site, she confirmed that native plantings, rather than the common sedum plant mix used on roof tops, offered benefits similar to a native prairie when it comes to storing rainwater, for example. 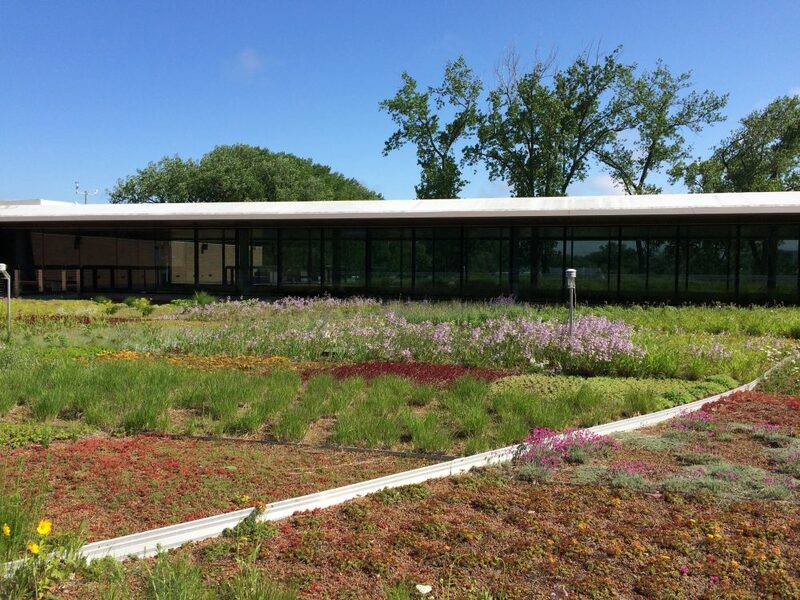 The Plant Science Center’s Green Roof Garden is an important resource. Planted in 2009, it serves as a living laboratory, classroom, research site, and a source of inspiration to visitors. A blooming population of Penstemon hirsutus was part of Dr. Ksiazek-Mikenas’ experiments. She then expanded to include plots on the Ellis Goodman Family Foundation Green Roof Garden South to study genetic diversity. She compared the genetic diversity of populations established from nursery stock to natural populations, finding more diversity in the natural populations grown from wild collected seed. On the heels of that finding, she studied populations on green roofs in Chicago near Lake Michigan to find out if the plants were able to share their genetic material with plants on neighboring roofs through pollination. She was thrilled to confirm that they did, as the exchange of diverse genetic material is essential for the long-term health of a species. Although there are limitations to green roof gardens, mainly due to the lack of soil depth and disconnected setting, Dr. Ksiazek-Mikenas is optimistic about their ability to sustain native species. She has presented her work at numerous conferences across the globe to academics and those in the landscaping industry. 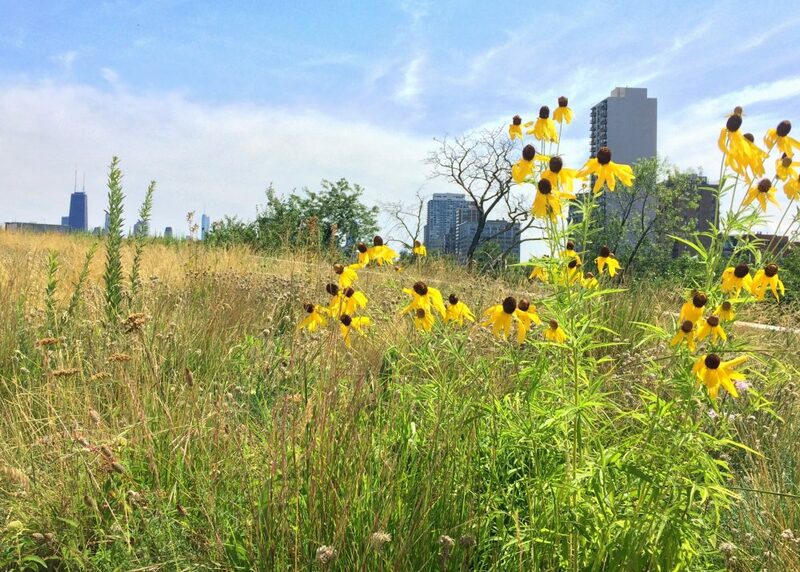 Two prairie species in Dr. Ksiazek-Mikenas’ experimental plots—Ratibida pinnata (foreground, right) and Lespedeza capitata (background, left)—bloom on a green roof on the Peggy Notebaert Nature Museum in Chicago. “In the future, I hope that green roofs can continue to provide ecosystem services to people but also increasingly support a wide variety of urban biodiversity,” she said. The motivated researcher is ready to move ahead with her career and intends to continue to bring her unique perspective to future students and to the development of more green infrastructure in this growing world.